This charming wooden toy helps young children stack up their fine motor skills. Don't tell Farmer McGregor! Instead of stealing carrots, this hoppity little friend is here to help young children have fun while building fine motor skills. 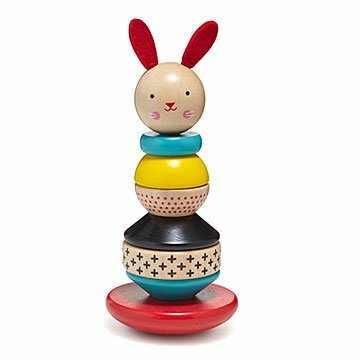 The chunky wooden beads and bunny head cap, with its soft felt ears, all slide onto a dowel built into the rocking base. The wood is decorated with colorful, non-toxic, water-based glazes that are safe in little mouths. Makes a sweet gift for baby showers or first birthdays. Made in China. Fun for grandbaby. Learning shapes, colors, building.